I'm excited to be performing with the incredible Nic Gerpe (piano) on Tuesdays @ Monk Space. We'll be performing John Luther Adams' monumental 4,000 Holes, in what I believe will be the first Southern California performance of the piece. An exciting event! Vicki Ray will premiere Sometimes I Feel Like My Time Ain't Long, with a video installation by Carole Kim, in a special concert as part of REDCAT's season under Walt Disney Concert Hall. Vicki Ray continues her mini-NorCal tour with a second performance of Sometimes I feel like my time ain't long at the University of the Pacific, in Stockton, CA. 7:30 pm. My arrangement of Nina Rota's La Strada will continue in repertory at Staatstheater am Gärtnerplatz in Munich, Germany, playing in September and October. Choreography by Marco Goecke. A preview performance of Sometimes I feel like my time ain't long at UC Berkeley with Pianist Vicki Ray. 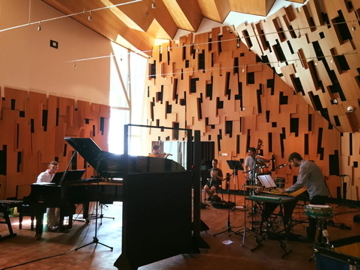 The performance will be at The Center for New Music and Audio Technologies (CNMAT) at 8 pm. The B Band returns with a performance at the Outpost Series at UC Riverside. There will be Mahler. I've written a new short and to-the-point piece for Panic Duo. They'll be performing it at Pasadena City College. Continuing my stint as a guest performer with the Los Angeles Percussion Quartet I'll be performing at the UCSB Summer MusicFestival. On the UCSB Campus 7 pm. I'll be a guest performer with the Los Angeles Percussion Quartet at the Museum of Making Music in Carlsbad, CA. 7 pm. I'm hard at work on a new arrangement of Nina Rota's La Strada in a new production at the Staatstheater am Gärtnerplatz in Munich, Germany, to be playing in July. A Nice Day for the Races. I'll be performing in an operatic setting of the Samuel Beckett radio play by composer Michael Webster at The Box in the Arts District. The Lord of the Rings live just keeps rolling along with concerts in Prague in December. There is a complete Trilogy of Lord of the Rings with the Chicago Symphony at the Ravinia Festival. I will be assistant conductor. Pretty huge. Excited to return to the Mann Center for the completion of the Lord of the Rings Trilogy with the Philadelphia Orchestra, live to video projection. I'm thrilled to be joining Jacaranda for performances of 2 Steve Reich Masterpieces: Drumming and Music for Mallet Instruments, Voices, and Organ. Should be fun. I'm excited to announce that I'm joing the roster of Nomus21, who will be representing my orchestral piece, Circus Maximus. You can check out their website - it's an exciting new music experiment. My Marimba Solo is available from Heartland Marimba Festival Publications... and they just updated their website which is looking great. So head over and check it out. Three shows of Return of the King in Munich! Bavaria! I'll be teaming up with Synchromy for a concert of Viola Music including Berio's Naturale at Bird Studio, Occidental College. 8 pm. I'm excited to join the incredible Hocket Duo at UCLA's Schoenberg Hall for a performance of David Lefkowitz's piece for pianos and percussion, Calder's Closet. In not-the-most-exciting-news, I've been making some long overdue housecleaning to the old website. This includes linking to more up-to-date recordings, and uploading some longer clips of my older pieces. Yes! I've placed a recording of my massive marimba solo, Night and Fugue for Marimba (alone) on SoundCloud. That's me performing it. I can't believe I played that many notes either. The Lord of the Rings Europe 2017 extravaganza continues for two concerts of The Two Towers, live to projection in Florence, Italy with the Opera di Firenze and the Orchestra del Maggio Musicale Fiorentino. Excited to work with the Orquesta Nacional de España for two concerts of The Two Towers, live to projection in Madrid Spain. Thrilled to head to Paris (!) with Lord of the Rings, where we will be presenting all three movies (!) in a row, with live symphony orchestra. I'll be performing Stravinsky's only opera, Rake's Progress, with the Pacific Opera Project. At Occidental College in Eagle Rock! The B Band heads to the Carlsbad Music Festival for some adventurous music by the beach (by Ben Phelps). We're offering a sneak peak during the afternoon of Mahler, Symphony no. 5! The B Band heads into the studio! I'm excited to be recording my new album / piece, Mahler, Symphony no. 5 by Ben Phelps. We're recording in UCLA's brand new and fancy recording studio. I can't wait to share this madness with the world! I'll be heading to city of brotherly love for a performance of The Two Towers with the Philadelphia Orchestra, live to video projection at the Mann Center. I'm unbelievably excited about this one. Perhaps you've heard of them. I'm returning to the music of JacobTV for the West Coast premiere of his multimedia opera The News. With the Long Beach Opera, but playing in Santa Monica at the Broad Stage!